Bose’s bread is hand-baked bread, fruit of manual work, of transforming selected natural ingredients, without the addition of chemical or ameliorative substances. 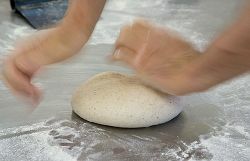 Bread is a symbol of nature and, at the same time, of culture, of man’s doing in harmony with nature. Man draws bread from the earth, Psalm 104 recounts forcefully, in order to remind us that bread is there, but at the same time only man knows how to draw it forth, knows how to call it to life. Bread, real yet symbolic food, is capable of evoking a reality that goes beyond material nourishment and of arousing questions about the sense of what makes something live. In being fruit of the earth and of man’s work, of nature and of culture, — in this dual cluster lies the bread’s naturalness, which is not only a physical-chemical datum or even an agro-alimentary product, because it is also and above all a cultural datum: bread expresses need, that which is truly necessary to live. 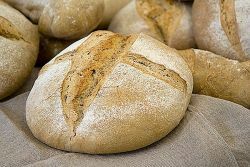 Bose’s bread, which recently became part of our monastic work, is hand-baked bread, fruit of manual work, of transforming selected natural ingredients, without the addition of chemical or ameliorative substances. Earth, air, water, and fire: the elements of life and of nature, unite in an intimate relation to create a unique product, symbol of life and of community. Since it is our desire to follow the oldest and most traditional bread-wmaking procedures we prefer high-quality flours, which come from selected grains and are preferably stone-ground, and slow rising, obtained by the “indirect method” through the prevalent use of sourdough. 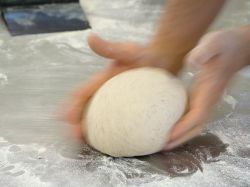 Sourdough is a paste of only flour and water left to mature for a long time in an absolutely natural way, to be then used in the process of leavening, in place of beer or chemical or other yeast. 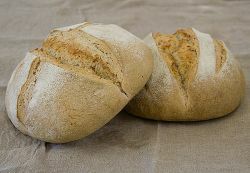 Given the long time necessary for rising — twelve or more hours — , the bread that is made from sourdough is softer and more elastic, keeps better (7–8 days), is easier to digest, besides possessing a unique taste and smell. 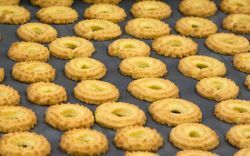 Among the bakery’s products there are also traditional cookies of Piedmont made with corn flour, butter, and eggs.